Why I still believe in Santa and hope my children will always believe too. I am nearly 40 and fully admit I still believe in Santa and I hope that my children will always believe too. If you are wondering how I have now spent 13 christmases buying presents from Santa, stuffing stockings on christmas eve, nibbling carrots and throwing them outside to look like they have been eaten by reindeer, brushing away the oats from the magic reindeer food and still haven’t twigged that there isnt a man in a red suit with a magic sleigh then don’t worry I haven’t completely lost it. I know there isnt a physical santa. 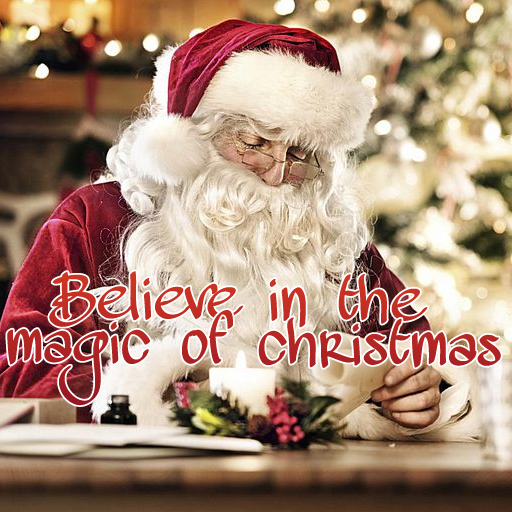 What I believe in and always will is the magic behind santa, what he stands for and symbolises, the amount of joy and happiness he has brought to millions of people all around the world for hundreds of years. While Santa in the physical form may not be real, the emotions and magic that he brings are very real. I believe that there is a little bit of santa in all of us because Santa is kindness, he is that warm happy glow that comes from giving something (however small) and seeing the joy it brings. He is the sparkle in childrens eyes who haven’t yet lost the ability to see the magic in everyday things. He is the ability to believe in something. He is hope and charity, reaching out and caring about those less fortunate. He is seeing the good in people and finding the good in ourselves. He is parents who go that extra mile to preserve the magic of Christmas for their children. He is volunteers who spend their Christmas Day providing meals for the homeless or the elderly, people who invite someone to Christmas lunch so they won’t be lonely on Christmas Day, the shoebox appeals, the santa runs to local hospitals, the food bank donations. The list really is endless. He helps teach children how to believe. He introduces them to the idea of being selfless and giving simply because it brings happiness to others. Santa is about caring and teaching our children how to care. He shows us that just because something can’t be seen with our own eyes it doesn’t mean it isn’t there. There is something special about Christmas that seems to bring out the best qualities in people. We have all heard about the famous Christmas ceasefire of 1914 during the first world war and there are so many stories and happenings the whole world over that illustrate just how powerful Christmas spirit is. We all see the festive period as a time to make that extra effort to be kind, helpful, to make time for loved ones and reach out to those less fortunate. This is what I believe Santa is. He encompasses and represents all of the good things about humanity. He shows us that in an often horrible world there is still good to be seen which is magical. Santa is this magic in all of us. So when my children start to question if Santa is real I will sit them down and let them in on the secret. Santa is so much more than a jolly little man in a red suit. Santa is the magic within all of us. He is the good in humankind. He is present all year round. As long as there is even the tiniest bit of good in the world that we believe in and allow ourselves to see then Santa will continue to exist. Oh I couldn’t agree more! Wouldn’t life be sad if we didn’t believe in a little magic sometimes? Previous Post A perfect morning at the Mere, Ellesmere.